The hardy basil shrub grows quickly and produces a profusion of foliage that can be used to make your favorite Italian dishes like pesto pasta. Though insect problems are relatively rare for basil, the shrub can occasionally be attacked by the black Japanese beetle. A holistic strategy incorporating manual removal and chemical control can help reduce the Japanese beetle population and save your plant from being eaten by the bugs. Remove the Japanese beetles manually from your basil plants. Pluck them off with your fingers. Alternatively, fill a bucket with soapy water. Place the bucket under your basil shrub and shake the shrub vigorously to knock the beetles into the water. Deter and suffocate Japanese beetles on your basil plants. Mix 1 qt. of water with 2 tbsp. of liquid dish soap. Pour into a spray bottle and shake it to mix the contents. 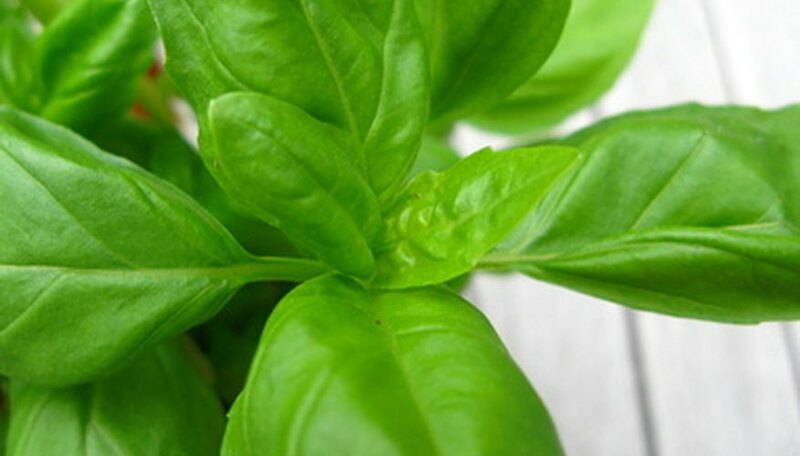 Spritz the soapy water onto your basil plants. The soapy mixture suffocates the beetles, while the residue deters future infestations. Spray your basil plants with a chemical-based vegetable garden insecticide formulated with acephate, carbaryl or a pyrethroid like cyfluthrin. Mist onto all exposed areas of your basil plant every 10 days until the Japanese beetle infestation subsides. Control Japanese beetle grubs in your soil to break the beetles' life cycle after treating your basil plant. Reduce watering as much as your basil plants can tolerate to dry out the soil, making the dirt less hospitable to the grubs and eggs. Apply a treatment of milky spore bacteria (Bacillus popilliae)--available at many garden stores and nurseries--to the dirt according to the bottle's directions, as spore count varies by product. The bacteria kill the beetle grubs. Don't use pheromone beetle traps, which are commonly sold to control Japanese beetles. These often attract more beetles to the area and are typically ineffective, according to Ohio State University.